Fascinating book: Charles L. Hughes' Country Soul: Making Music and Making Race in the American South (Chapel Hill: The University of North Carolina Press, 2015). Much to ponder. Country Soul takes a clear-eyed look at the interconnections between music production and distribution, cultural impact, ideas about race, and politics. 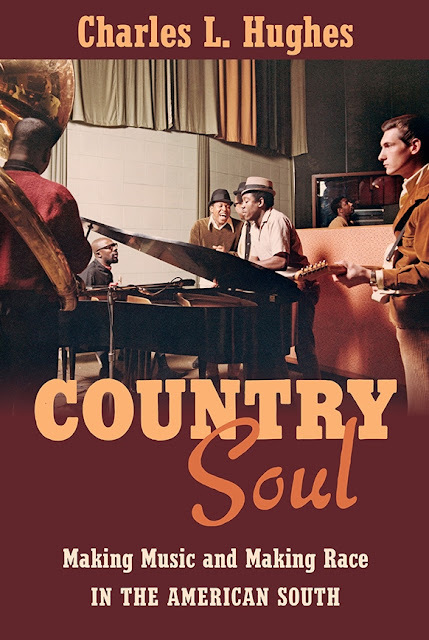 Reaching back to the 1960s and 1970s and then progressing forward, Country Soul is completely relevant to our time. "[M]usicians of the country-soul triangle [Memphis-Nashville-Muscle Shoals] became pivotal actors in the larger trajectory of U.S. racial politics in the twentieth century. Both literally and figuratively, they produced the cultural markers of race that . . . reshaped the ways people in the United States (and internationally) understood the supposed similarities and differences between black and white" (page 3). Hughes looks at a spectrum of recording artists (ranging from groups like the Staple Singers to Lynyrd Skynyrd) and challenges quaint myths about broad racial harmony in the South. As for politics, "In the 1970s the [white] South embraced a rightward political drift symbolized by George Wallace and Richard Nixon and scored by the period's mainstream country music . . . The new music scenes played a striking and surprising role in the silencing of African Americans. In Texas . . . both Austin and Houston earned national attention as musical accompaniments for the New South, whose celebrated artists were almost entirely white" (pages 164-165). And: "In a sad echo of Confederate and segregationist apologists, the dominant narrative suggests that everything was fine until outsiders showed up . . ." (page 192). Which reminds me, Hughes quotes singer Merry Clayton (probably most widely recognized by her powerful backing vocals on "Gimme Shelter" and "Sweet Home Alabama"): "There was nothing sweet about Alabama. You can hear our anger" (page 162). As for Hughes, he comes across as telling it like it is. I'd probably like this. Have you ever read James Sallis's books. He writes learnedly of old blues. This is a subject that I have always found fascinating, although being Canadian I am more familiar with the similar narrative that centred around Detroit and Motown. This sounds like a worthy book.